The Toddler House is prepared with the specific needs of that age group in mind. What are its characteristics? It is a very orderly environment, because routine and physical order help the child develop his or her mental order. It is a time and place for the toddlers to acquire skills, gather information about their world, experience a role as a contributing member of a social group, and develop their individual personality through concrete experiences of their day-to-day activities. Teachers work to create a beautiful, structured, and orderly classroom environment. Children in the Toddler House refine their understanding of the world through engaging and enticing interactions, movement, and activities. 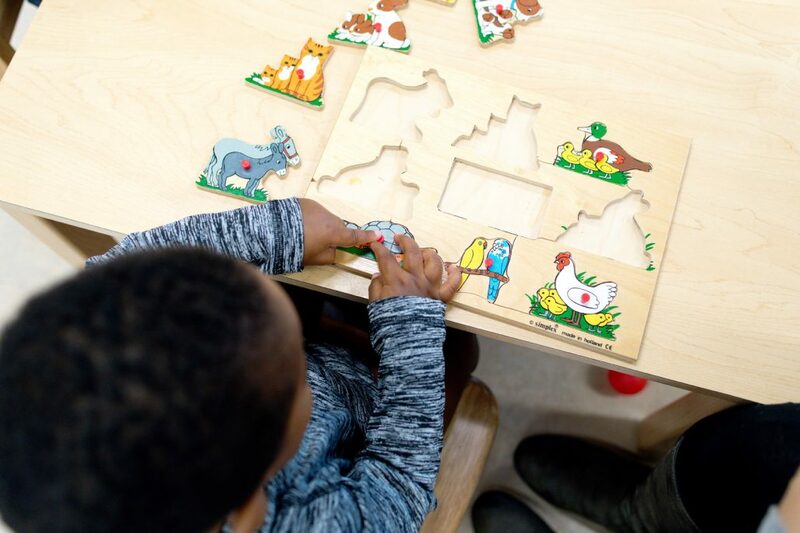 Teachers carefully select materials and activities based on a toddler’s cognitive, social-emotional, and physical development. These young children are also in a prime developmental period for acquiring language. That is why we expose them to beautiful, precise, and factual language that not only provides names of things, but provides the language to describe qualities, feelings, and emotions. The young child’s energy is never-ending. Each toddler is actively working on becoming more skilled and coordinated with his or her body. We provide activities that allow them to become more coordinated by walking, balancing, and carrying things around the room or using tools to complete activities. The young toddler is also exposed to activities that will help develop the fine motor skills. 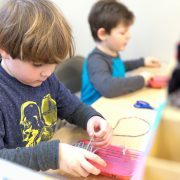 Teachers introduce materials that require a wide range of grasps and hand-eye coordination like placing rings on pegs, sorting objects, exploring object-permanence, stringing beads, completing peg puzzles, exploring with blocks or balls, and even sewing! Materials are beautiful, constructed of natural materials, and rotated frequently. All the activities in the Toddler environment appeal to the child’s interests and all for the physical and mental energies to work together. This is when the child is happy, feels content, and is satisfied. Activities must present a challenge to children and be purposeful. Driven by his or her insatiable quest for independence, the mastery of a skill is the child’s unique motivation. Language is pervasive throughout the environment. There is a focus on guiding children with respectful, courteous language and a perspective of helpfulness. Above all, teachers work together to create a warm, nurturing and safe space for every child. Teachers look for opportunities to support conversation, read poems and books, and introduce fun language games. We present children with large, beautiful pictures and replicas of animals, familiar objects, types of motorized vehicles, etc. and we give them the precise vocabulary attached to them. It is important for children to attach a concrete experience to words at this stage as the young child has such a concrete mind. School Hours for Toddler House (approximately 14 months and walking to 3 years old): 8:10-8:30 a.m. drop-off; 12 noon pickup. After School is available until 3 or 5:30 p.m.
Parent education is also an integral part of the responsibility of the Toddler House Lead Teacher. At this age, children require consistency in their lives, not only in the day-to-day routines, but also in the guidance they receive from adults. How adults respond to the young child’s needs is very important — from toileting to feeding to responding to tantrums. The process is made easier through a consistent approach at home and at school. 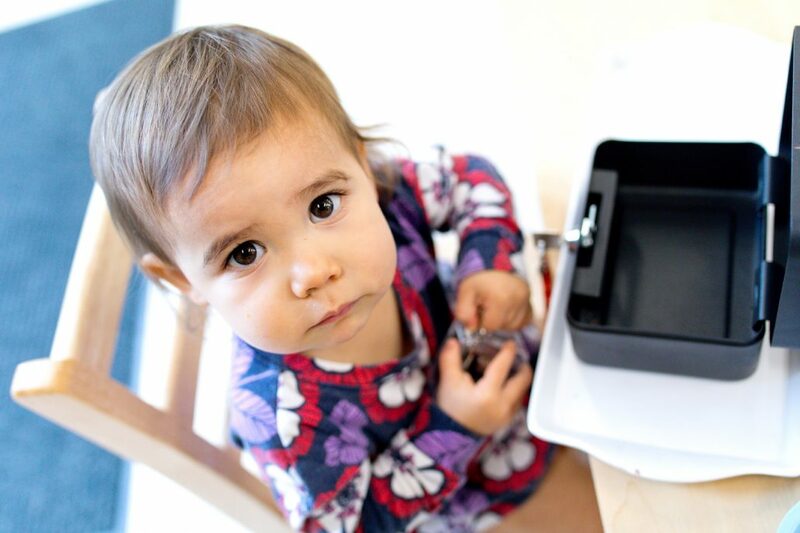 Through Parent Education Sessions, we provide guidance to parents to help maintain the consistency their child finds in the Toddler House environment.